After making so many blankets in a row, it was a nice break to do a quick little project. 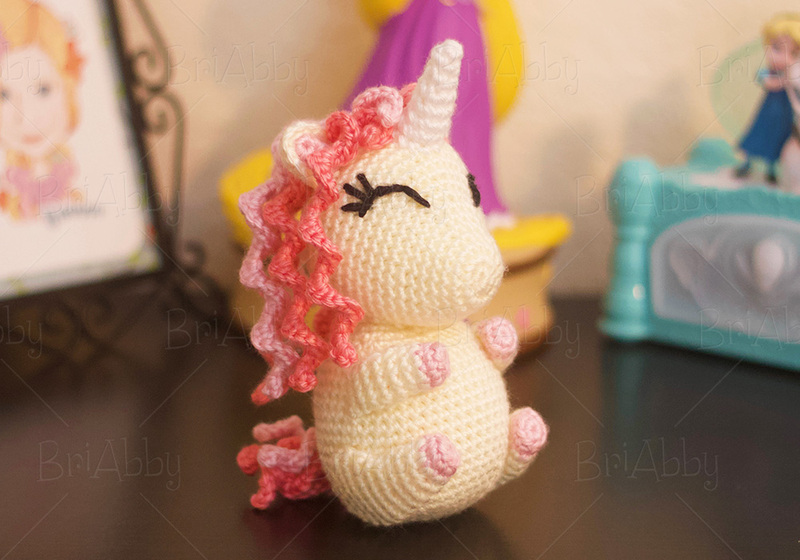 I’ve been wanting to make a miniature unicorn for a long time now and I figured since I just started my Pudgy Pal collection, that a unicorn would be a great addition. As always, my daughter saw it and BEGGED me to give one to her. Once I agreed, my son of course told me that I needed to make him a dragon pudgy pal. So at some point you are going see one of those. What other kinds of pudgy pals should I be adding to my collection? So far I have piggies. . .
And of course our new unicorn pudgy pals! Don’t you just look at them and want to squish them? I kind of wish they were real because they look like they’d make amazing pets. If you want a little toy that works up quickly, then go for the closed eye version. If you want a more detailed one that takes a little more work, but is crazy gorgeous, then of course go with the open eye version. The pink one is the one my daughter chose to keep. As soon as I finished the white one though she changed her mind and said she wanted that one. Then the next day she changed her mind again and said she wanted the pink. Basically I think her tactic is to just keep changing her mind over and over again until I give in and give her both. Joke’s on her, it ain’t happening! I refuse to full on spoil her (only halfway spoil her apparently). I think these might be one of my go-to patterns when I want to make a gift for little girls. If you are wanting to give them a try yourself, you can get the pattern here. Be sure to use code PudgyUnicorn at checkout to get 20% off your pattern through 1/17/18 at midnight (Mountain Time). This is one that I would especially love to see everyone’s finished products of. You all get so creative with your different colors and they are fun to see. If you make one, please share with my group here!